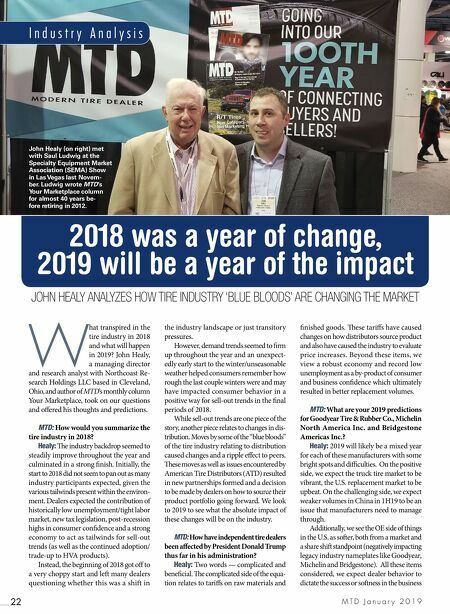 JOHN HEALY ANALYZES HOW TIRE INDUSTRY 'BLUE BLOODS' ARE CHANGING THE MARKET M T D J a n u a r y 2 0 1 9 22 I n d u s t r y A n a l y s i s W hat transpired in the tire industry in 2018 and what will happen in 2019? John Healy, a managing director and research analyst with Northcoast Re- search Holdings LLC based in Cleveland, Ohio, and author of MTD's monthly column Your Marketplace, took on our questions and offered his thoughts and predictions. MTD: How would you summarize the tire industry in 2018? Healy: e industry backdrop seemed to steadily improve throughout the year and culminated in a strong finish. Initially, the start to 2018 did not seem to pan out as many industry participants expected, given the various tailwinds present within the environ- ment. Dealers expected the contribution of historically low unemployment/tight labor market, new tax legislation, post-recession highs in consumer confidence and a strong economy to act as tailwinds for sell-out trends (as well as the continued adoption/ trade-up to HVA products). Instead, the beginning of 2018 got off to a very choppy start and le many dealers questioning whether this was a shift in the industry landscape or just transitory pressures. However, demand trends seemed to firm up throughout the year and an unexpect- edly early start to the winter/unseasonable weather helped consumers remember how rough the last couple winters were and may have impacted consumer behavior in a positive way for sell-out trends in the final periods of 2018. While sell-out trends are one piece of the story, another piece relates to changes in dis- tribution. Moves by some of the "blue bloods" of the tire industry relating to distribution caused changes and a ripple effect to peers. 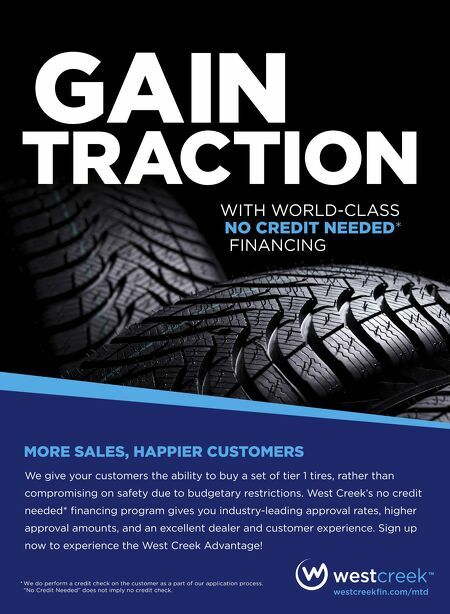 ese moves as well as issues encountered by American Tire Distributors (ATD) resulted in new partnerships formed and a decision to be made by dealers on how to source their product portfolio going forward. We look to 2019 to see what the absolute impact of these changes will be on the industry. MTD: How have independent tire dealers been affected by President Donald Trump thus far in his administration? Healy: Two words — complicated and beneficial. e complicated side of the equa- tion relates to tariffs on raw materials and finished goods. ese tariffs have caused changes on how distributors source product and also have caused the industry to evaluate price increases. Beyond these items, we view a robust economy and record low unemployment as a by-product of consumer and business confidence which ultimately resulted in better replacement volumes. MTD: What are your 2019 predictions for Goodyear Tire & Rubber Co., Michelin North America Inc. and Bridgestone Americas Inc.? Healy: 2019 will likely be a mixed year for each of these manufacturers with some bright spots and difficulties. On the positive side, we expect the truck tire market to be vibrant, the U.S. replacement market to be upbeat. On the challenging side, we expect weaker volumes in China in 1H19 to be an issue that manufacturers need to manage through. Additionally, we see the OE side of things in the U.S. as soer, both from a market and a share shi standpoint (negatively impacting legacy industry nameplates like Goodyear, Michelin and Bridgestone). All these items considered, we expect dealer behavior to dictate the success or soness in the business 2018 was a year of change, 2019 will be a year of the impact John Healy (on right) met with Saul Ludwig at the Specialty Equipment Market Association (SEMA) Show in Las Vegas last Novem- ber. Ludwig wrote MTD's Your Marketplace column for almost 40 years be- fore retiring in 2012.